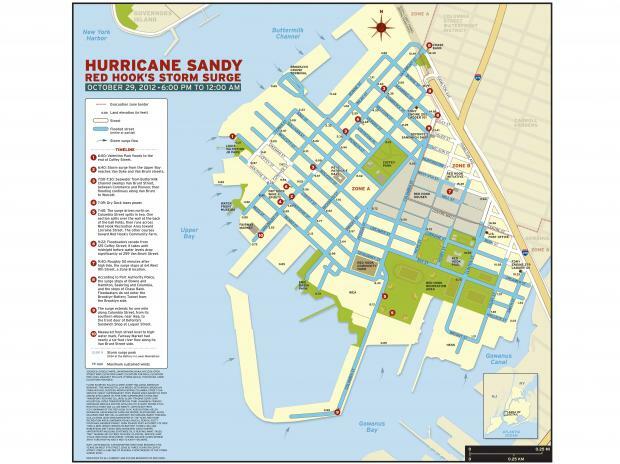 RED HOOK — A local resident and cartographer has mapped the flooding caused by Hurricane Sandy in the neighborhood, along with a timeline that plots the storm’s surge into Red Hook. Mapmaker Jim McMahon, who is also a writer for Scholastic, wanted to create the map to “have an insider’s view of what happened [in Red Hook],” he said. For two weeks, McMahon walked the streets, interviewing about 60 people to find out what happened on Oct. 29, 2012, when the surge struck Red Hook. McMahon said he spoke to residents of the housing projects, FDNY and Port Authority officials, as well as people who live and work in Red Hook. After listening to people’s stories from the storm, he put together a comprehensive timeline and map of the flooded neighborhood after Sandy. “Every part of the neighborhood was linked,” he said. In his efforts, McMahon also wanted to determine the land elevations above sea level at different points in the neighborhood. Using an app from the U.S. Geological Survey, McMahon measured the elevations at street corners and parks to alert residents when to evacuate for future storms. “I don’t think people realized how low they are,” he said, adding that several locals were unaware that they were only a few feet above sea level when Sandy’s nearly 14-foot surge hit Red Hook. McMahon hopes the map will “become a historical document of what happened,” he said. The map also shows a portion of the neighborhood near the water that was not flooded. Van Dyke Street, Coffey Street and Dikeman Street between Ferris and Conover streets remained mostly dry after the storm. According to McMahon’s map, the elevation on Ferris Street in that area is close to 10 feet high, making enough of a natural elevation to stop excessive flooding. “If the storm proved anything, it proved that that area remained dry,” he said. Last year, McMahon called on the city to install elevation markers in flood-prone neighborhood. “In a time of catastrophe.. it would be helpful to know that,” he said. The map is on sale at the Kentler Gallery and Home/Made on Van Brunt Street.